Steeped in history and building for the future, Solent Airport, formerly Daedalus airfield, is located at Fareham, Hampshire and is operated by Regional & City Airports Limited. 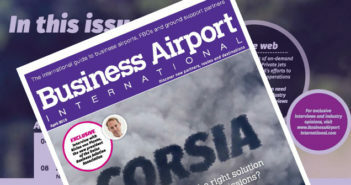 With a new runway surface (December 2014), aircraft refuelling, on-site engineering, hangarage, outdoor parking, along with flying tuition and flight experiences the airport has successfully created a market for both corporate and general aviation aircraft as a gateway to the South of England. The airport can currently support aircraft up to MTOW of 10,000kg. The Airport offers a dedicated passenger and crew lounge with complimentary refreshments and beverages along with dedicated apron parking all without the congestion. 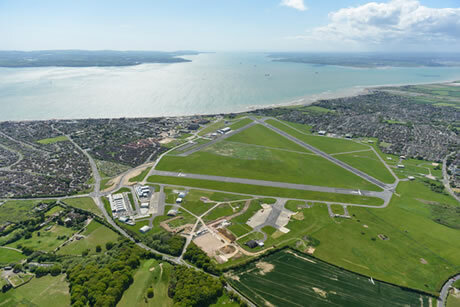 Equally as with other FBOs Solent’s team can provide weather briefings and local information to aid their clients as well as providing special rates for both catering, chauffeur driven cars, refuelling and corporate hotels. 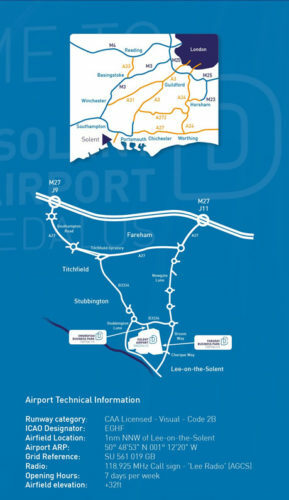 Solent Airport’s catchment of Hampshire is a significant aerospace and defence employer with an outstanding cluster of world-wide companies and some of the best research and development facilities globally. Companies include; NATS, BAE Systems, GE Aviation Systems, Honeywell Aerospace, Meggitt Avionics, Lockheed Martin, Eaton Aerospace, GKN Aerospace, EADS Astrium, Turbomeca, QinetiQ, Boeing, Vector Aerospace, Sodexo Defence Services, Harrods Aviation, AgustaWestland, Thales, Northrop Grumman and Finmeccanica. Other key industry sectors also situated in the region include Marine, Financial and Business Support, ICT, Digital Media, Distribution & Logistics.